Matt Tifft has joined Front Row Motorsports to drive the No. 36 Ford in the Monster Energy NASCAR Cup Series in 2019. Next season will be Tifft’s first in the Cup Series. 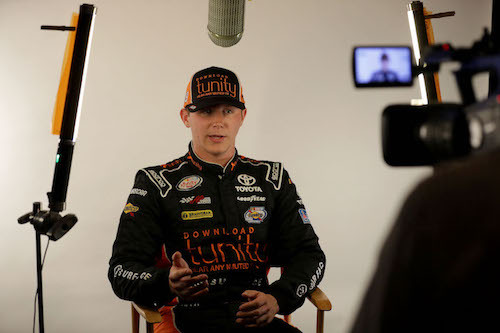 The season-opening Daytona 500 on Feb. 17 will be Tifft’s Cup Series debut. With the addition of Tifft, Front Row Motorsports will expand to three full-time Cup Series entries, continuing to field the No. 34 for Michael McDowell and the No. 38 for David Ragan. The No. 36 will replace the No. 23 that FRM fielded as a Toyota at the end of the 2018 season. Front Row Motorsports purchased the bankrupt BK Racing during the 2018 season and needed to finish the season fielding the formerly-BK Racing No. 23 to maintain the charter it obtained through through the purchase of BK Racing. The charter obtained through the BK Racing sale actually was a fourth charter for FRM, as it leased a charter to TriStar Motorsports last season that was purchased from BK Racing in 2016. Tifft raced full-time in the NASCAR Xfinity Series the last two seasons, first for Joe Gibbs Racing and then, for Richard Childress Racing. He made the Xfinity Series playoffs both seasons. In all, Tifft has 77-career starts in the Xfinity Series, resulting in nine top-fives and 38 top-10 finishes. Tifft also raced in the NASCAR Camping World Truck Series, running partial schedules in 2014, 2015 and 2016. In 25 races, he posted a top-five and nine top-10 finishes.